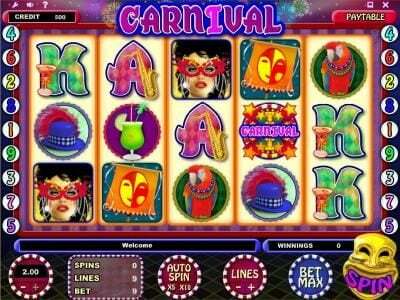 Carnival is a 5 game reel online slot machine with a max payout of $40,000 using the carnival theme. 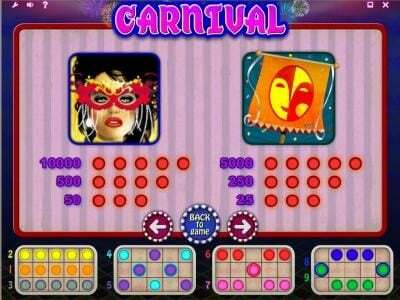 Carnival Slots has not been reviewed yet, be the first to rate this slot. 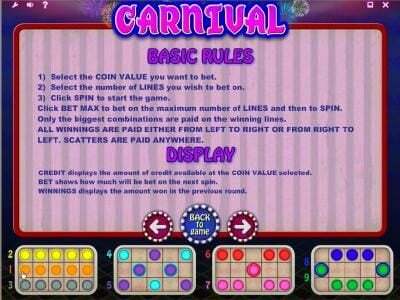 Carnival, which is a game from iSoftBet, has 5 reels and 9 paylines, with multipliers, scatters and wild symbols as its features, while its prizes go up to $40,000. The Brazilian carnival that takes place in Rio De Janeiro each year is a famous event, which attracts people from all over the world, each year. 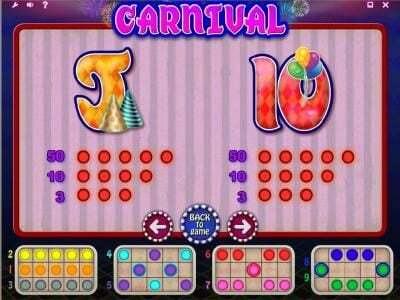 This is the carnival that gets the attention of this Slot, and most of the symbols added to the game try to give us an idea of what we can expect to see if we take part ourselves. There are fireworks all around the reels, just like you would see them in the night sky during the fiesta. 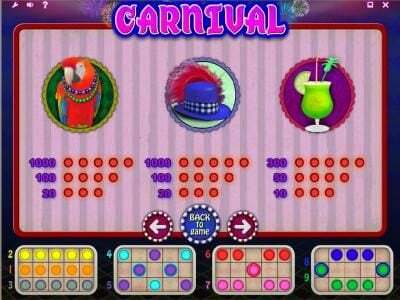 The party continues on the reels, where colorful symbols use images of fireworks, masked dancers, flags, parrots, hats, cocktails and card symbols. 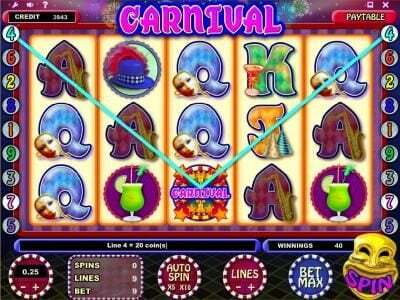 The game offers us 9 lines to bet on, and in each case, the player can use a coin which has a value between $0.02 and $2. The result is a maximum bet of $18, with the top payout of 20,000 coins being worth up to $40,000. The symbol which you want to see on the lines is the one with the masked lady, since it will give out a 10,000 coins prize for five symbols. The reason why the top payout is 20,000 coins is because the prize will double if one of the five symbols is a wild. The wild in question is the symbol with the game’s logo on it, which is called a Bonus symbol on the paytable, though based on its functions and substitution powers, it’s clearly a wild. The symbol has a 2x multiplier as well, which is applied on all combinations that it helps form. 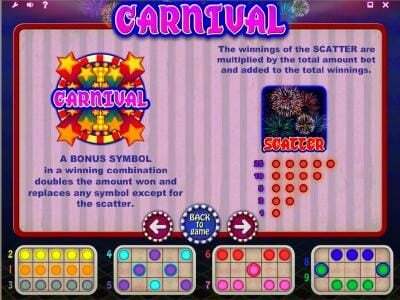 The scatter symbol has fireworks on it, and it gives the player payouts of up to 25 times what the bet was for that round. 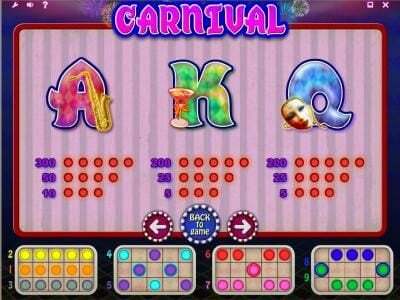 The requirement is the appearance of the scatter symbol in multiple positions around the reels, up to 5 of them if you want the highest payout. The game’s payouts seem to be on the high side, with the second best symbol giving away 5,000 coins, and the next two giving up to 1000 coins each one. It’s always great to see a game that is so colorful, and with a happy theme. Carnival gives us the chance to celebrate with the rest of the people that attend the Rio Carnival.